You know those motivational posters? The ones with the ants carrying a HUGE acorn, or a cute bear cub just hanging on over a rushing stream, or rowers — all in synch, gliding into the sunset? 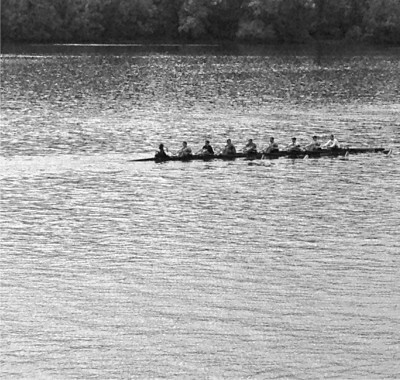 I have spent days on the Potomac River watching whole slews of such rowers. The idea that a team works all in synch makes sense. But to do so, must all the members of a team be the same? Each person in an eight-oar boat has a different role. You have the coxswain — steering, haranguing and encouraging. The stroke, steady and sure. Seven seat, making sure that the stroke’s rating is conveyed back through the boat. The engine room — four really strong backs — getting ‘er done. And the bow pair, setting the tone for balance and a certain restraint. Now, your team at work: You have an engine room, a stroke, maybe two or three coxswains. But do they all know the roles they are playing? Are you calling on their strongest suits, or asking them to be the blunt force of strong backs when they might be better at the fine detail? Knowing the different roles for your team mates on the field, the river, the court is good. Being able to translate some of that sporting knowledge into new understandings in the office setting is really useful. Pick your sport or activity: Does it tell you something about your team at work?